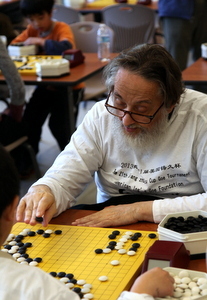 Although there were many familiar faces at the annual Jujo Jiang Ing Cup last weekend, there were many new faces as well. “This year Jujo brought a group from China, led by former LG Cup titleholder — and Chinese National Team Coach — Yu Bin 9P,” reports organizer Ernest Brown. “Also on the tour was Li He, current women’s world go champion.” Nine amateur players from the Chinese contingent joined more than 70 local players on the boards, including Herb Doughty, Steve and Matthew Burrall and Martin Lebl. The 21st Jujo Jiang Ing Cup was held January 26 in San Francisco, sponsored by Ing’s Goe of California and organized by American Ing Goe and the Bay Area Go Association. “Go in the San Francisco area seems to be thriving,” Brown added. The one day, 4-round event used the Go Clubs Online pairing software for the first time, and Brown reports that “The software held up well without any technical problems. We plan to use it again and encourage pre-registration for future tournaments.” Every contestant received a t-shirt from Jiang’s go school in China along with a carton of Kid Robot collectible “Fat Cap” figurines as door prizes. “Jujo plans to bring an even larger group to next year’s tournament,” Brown says.